At Swift Textile Metalizing LLC, we have developed proprietary conductive fabrics used by the aerospace, military, medical, and commercial electronics industries. 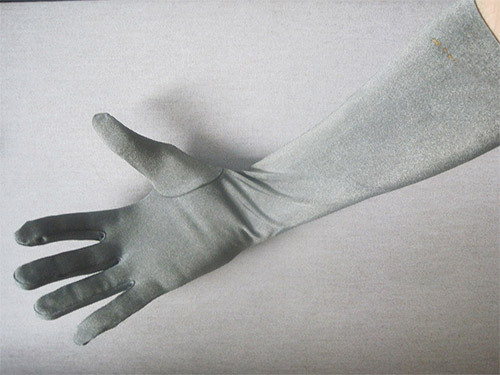 The product shown here is a silver coated glove with EMI shielding properties. When the customer commissioned this project, they requested a long, large glove that would be able to stretch and last through repeated uses. Our proprietary coating processes apply the metalized coating to the fabric while maintaining the fabric's flexibility. In addition, our metalized fabrics are anti-static, anti-microbial, and corrosion resistant, making them ideal for a variety of applications. The base fabric used in these gloves is a knit nylon-lycra blend that is then coated with silver. Shielding and conductivity tests were performed to verify that the fabric met all customer specifications. These gloves are produced in a variety of standard sizes and are used throughout the electronics industry. The turnaround time of this product is approximately 4 to 6 weeks. For additional information about this custom conductive material project, see the table below, or contact us directly.